This is not the best picture of the dish that is now my favorite summer side but it was all I had. This dish disappeared quickly. Now, I admit that we love vinegar in all its forms. The sweet with a bit of a sour bite after is one thing we look for in dishes. This dish has it all. I thought the recipe sounded strange as I was reading it on Pinterest but I am so glad I tried it. 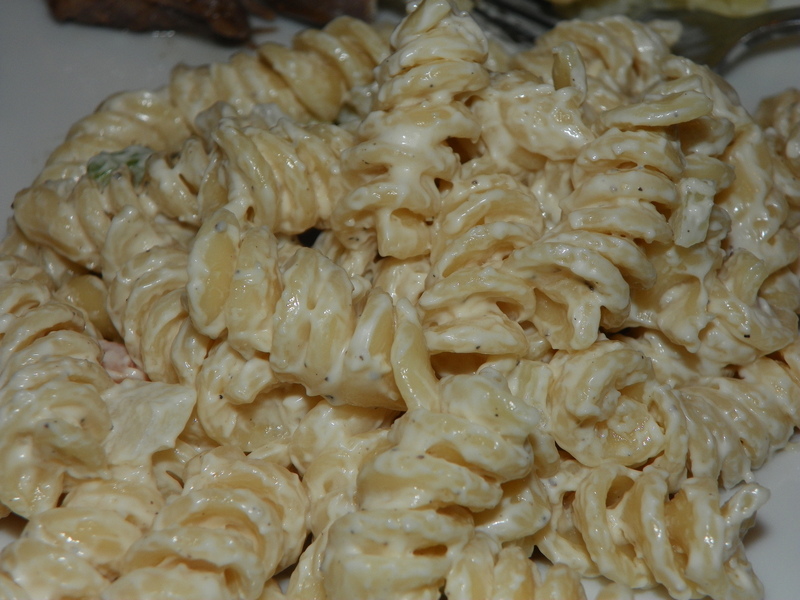 The original recipe I followed for the Hawaiian Macaroni Salad is from I Believe I Can Fry. Mix together the brown sugar, 1/2 cup of milk, 1 cup of mayonnaise, salt and pepper in a bowl. Mix carrot, onion, celery, 1 cup of milk and 1 cup of mayonnaise in a dish. Once pasta has cooled mix this into the pasta and let refrigerate for at least an hour. The longer it sits the better the flavors blend. Taste and add salt and pepper as needed. We served our Hawaiian Macaroni Salad with grilled cheeseburgers and a green salad. It made a great first meal that tasted of the coming of summer. Pingback: Rochester Style Garbage Plate with Meat Sauce | What's for Dinner Mom? Pingback: Hawaiian Macaroni Salad – What's for Dinner Moms?